It’s arguably the biggest welterweight unification fight since Curry-McCrory, and fans are desperate to see it: Keith Thurman, WBA/WBC ruler, against Errol Spence, the IBF champ. 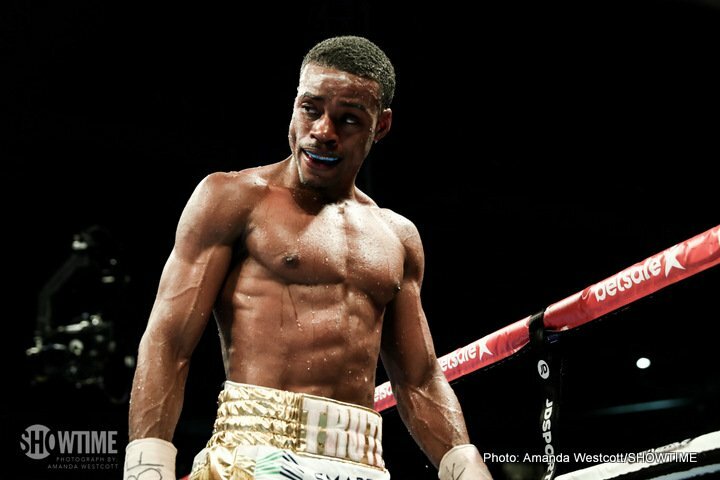 In the opinion of some good judges, the unbeaten Spence has already proven himself as the best 147 pounder in the sport today; others need further proof. And the gifted southpaw who relieved the long-reigning Kell Brook of his IBF belt in May of this year is fully intending on providing this proof. We await Spence’s next fight, his first defence, but word is, it is likely for January; perhaps against Lamont Peterson. Thurman is set to return to the ring in January himself, having fully healed during his latest layoff. Then, hopefully, some time in 2018, these two 147 pound stars will meet. 27 year old Spence, 22-0(19) spoke with Sky Sports recently, and “The Truth” made it clear he intends to prove his bold nickname is one he is worthy of carrying. Spence wants all the titles at 147 and he wants them asap. But as we know, Spence will have to wait a little while longer for a fight with “One Time” – and many fans felt he would have made his first title defence before now. It will be interesting to see who gets the first crack at Spence’s belt, but a fight between he and Peterson would be a good match-up on the way to bigger things for the southpaw. The 147 division is red-hot right now, and Spence can keep his tools sharp as he awaits the huge, career-defining fights he wants. And we fans sure want to see Spence get the mega-fights he craves. Spence-Thurman has guaranteed classic written all over it. Let’s hope Thurman does indeed return to action in January, wins and then calls out the man who has been calling him out!